Banks: It’s still not over, but nearly. 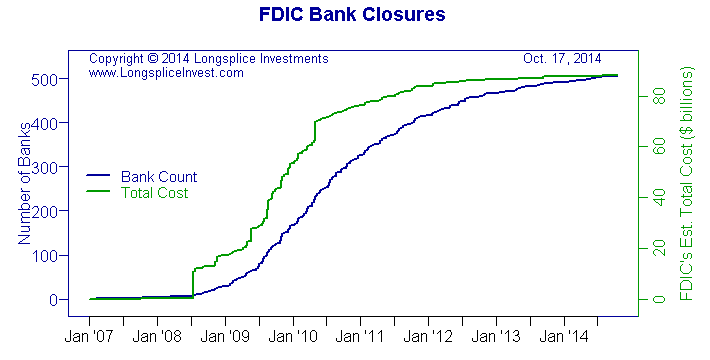 The FDIC having to close failed banks may seem like– ok, it is– old news, but it is still happening. It’s not above-the-fold news, though, because failures now are small, few, and far between. They closed another today, costing the FDIC insurance fund a mere round-off error of $24 million added to $90 billion total. More interesting, until today we’d had the longest gap, 12 weeks, without a failure since 2008. That’s worth noting as good news. Yes, a bailout. Not just a loan. Their argument is that they took loans at premium rates, and paid back the loans and interest, generating a profit for the government. That specific snippet is tolerably accurate. What they imply that isn’t true is that they paid market or above-market rates for those loans. That is totally false. In the few cases where banks got their rescue loans from private investors, which is by definition the market rate, the costs of the loans was much higher. Long story short, the Fed/Treasury loans to banks in the heat of the crisis were at rates defined in terms of percent, just like when you buy a house. The percentage rate was higher than a mortgage rate (“See! Not a bailout!”, they cry) but actually lower than the roughly 18% that some people pay on their charge cards. Quick quiz: do you think the big banks at the peak frenzy of the financial crisis were more or less creditworthy than a typical credit card holder? Keep in mind that some of those banks that didn’t get the loans failed. In my opinion, the banks were riskier, and the American public was not adequately rewarded for taking that risk. We can compare the government rescue terms to the few examples of banks that got their rescue privately. The private– market– rate for a rescue is described in terms of multiples, not percent. An investment group … stands to gain more than $3 billion from a bet made on a failed lender during the depths of the financial crisis. The investment group bought the bank in early 2009 for $1.55 billion. Including the dividends the group collected from OneWest’s earnings in the years since, the investors are due to rake in more than $5 billion. That is the market rate for that type of loan. There are other examples if you want to continue. It’s not these financiers who did something wrong. The shame lies on the officials at the Treasury and the New York Fed who gave away such a sweet deal. Have you ever wondered why conventional macroeconomic dogma says that if the economy gets overheated and inflationary, the cure is to (raise interest rates to) cause a recession, so people will be laid off, so wages will be held down? Or that a little inflation (say, up to two or three percent) is okay because it lowers the real (after-inflation) cost of labor, unless labor can demand pay raises to keep up? Is it really necessary that economic stability be built on keeping the working people down? Labor, by the way, doesn’t refer just to unloading boxcars, but to any wage or salaried work by people. If you get a W-2 or a 1099 to report your annual earnings, you’re labor. The answer is “no”, it is not necessary to throw workers under the bus to keep the economy properly lubricated. That’s just one of the ways that the system is stacked– by human law, not natural law– against workers. I learned that quote as an undergrad from an EE professor. It’s widely attributed to the usual amusers: Mark Twain, Will Rogers, Artemis Ward, and others. I don’t know who said it first. I only know who said it to me, for the first time that I can remember. Investing is overflowing with things we know that ain’t so, things we may have known but forgot, and things we think we can surmise but can’t possibly know. You are browsing the ‘The Stock-picking Process’ archive.